SULFITES (or sulphites) are commonly used preservative agents in many types of food and drink, including fruit products such as jam, juice, dried fruits, and wine. 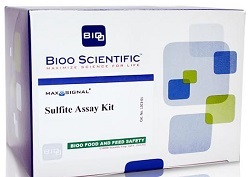 The detection and determination of levels of sulfites in foodstuffs may be a little quicker and easier in the future, thanks to the introduction of the MaxSignal Sulfite assay kit from Bioo Scientific. The company says this new kit is a convenient and robust system for the detection of total sulfites in multiple sample types. This assay uses a rapid aqueous extraction, and an enzymatic reaction that requires only 20 minutes to reach completion. The MaxSignal Sulfite assay kit can detect as little as 0.5ppm of sulfite in aqueous extractions, says the company. Its innovative new format is said to offer more accurate results when testing problematic high-creep samples, and is geared toward the common regulatory limit of 10ppm. The kit provides enough material to perform 50 determinations in a 1ml cuvette, or 192 determinations in a microtiter plate (plus additional material for controls). The detection range is from 0.5 to 1200ppm, and the assay kit is manufactured to the international quality standard ISO 9001:2008.